A Diamond of a Blues Concert. Critics of the Blues guitarist; and I used to count myself as one; should beware…..Joe Bonamassa has finally grown into his own multi-skilful persona and is currently making leaps and bounds beyond what anyone else is doing within the Blues field at the moment. Joe was never one of the crash, bang, wallop – volume is everything, type of guitarist; but he was guilty of going off on long meandering guitar solos, yet recently he has developed a fluid ‘less is more’ style of playing; much in the style of the Three Kings, Freddie, Albert and BB,whom he even dresses a bit like rather than the long haired, sweaty British adrenaline fuelled players of his youth. Then there is his ‘voice’ of which I was quite critical a couple of years ago. Joe was never going to be the new Howlin’ Wolf or Robert Plant, but on his last three albums (plus this one) he is a lot more curbed; in much the way his string bending is now and his records are all the better for it (in my opinion). He now uses his voice as an instrument rather than a weapon. 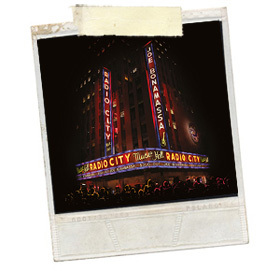 Which all brings us to Live at the Radio City Music Hall; a venue Bonamassa has dreamed of gracing since his childhood days. The concert begins with the audience screaming their welcome as he enters the stage then the band kick straight into I Can’t Be Satisfied last heard on the Muddy Wolf album. At first I smiled when Joe sang ‘I felt like slapping my pistol in your face’ as there’s no one less likely to do such a violent thing; then I realised that it’s the quiet ones you have to watch out for’; and suddenly there was a lot more menace in the song. As usual on his live albums and in concert; there’s virtually no chat nor introductions between songs; but that just leaves more valuable time for the music; which is loosely based around the recent the Different Shades of Blue album. Everything is expanded from the original album versions (of course) but every track is enhanced by the additional soloing (from band members too) rather than the loose jamming you hear on a lot of Live Albums. Just like on the album of the same name Different Shades of Blue is exceptional with Joe Bonamassa’s cultured right hand complimenting the majestic string pulling and pressing of his left; then there’s his velvetty voice which has never sounded more emotional, nor better I hasten to add; and it is a similar story with Dust Bowl, earlier in the concert. The star appears to take a step back several times; allowing the band member to shine in the spotlight and I especially love the Hammond playing whenever it slides into earshot – it made Muddy Wolf a fuller sound than usual; and does it again here. As a Master guitarist Bonamassa plays the simple stuff intricately well and the intricate parts very simply; and on Love Ain’t a Love Song his playing and singing prove he can do get down and dirty with the best of them; and come out on top. The album closes with So What Would I Do? Coming in at over 9 minutes long; it starts as a piano led ballad before slowly reaching a restrained; but still a powerhouse crescendo at the end. All in all Live at Radio City Music Hall is an exceptional album; sounding as perfect as a live concert can and coupling a handful of his better songs together; without being anywhere near a Greatest Hits. It’s much more than a simple record of a concert and bares repeated listening. It’s as if he’s done this before.